Click here to see the new features that were brought in to each previous version. Useful to see what features were included since your version. All conservatories are highly configurable to the customers requirements. These include P-shape, T-Shape, Hip Back and Bay cornered designs amongst others. 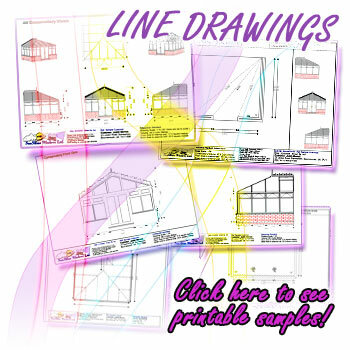 Depending on the style chosen you can define: Overall width, depth, height, pitch, Bay width, Bay Facet width, Lean-to width (left & right), Lean-to depth (left & right), Lantern width, Lantern depth and rafter spacing. FACT: Every conservatory on the system can also be further configured with the amazingly powerful 'Roof cut-out' option. This feature allows you to dissect the roof to make way for chimney breasts etc! This would only normally be found in expensive '1-off' design packages, but comes as standard in our software. FACT: ComfortbaleConservatories is compatible with Windows® 2000, XP, VISTA (32bit & 64 bit) & 7 (32bit & 64 bit). An OpenGL v1.1 or higher compatible video card or chipset is also required to run the 3D engine. Allows you to set the following defaults for your conservatories, which can speed up creation time to within seconds.. 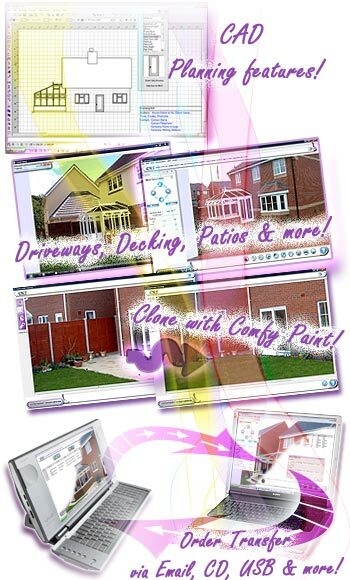 FACT: Using the conservatory softwares "defaults" feature, you can massively reduce the time taken to create a conservatory in front of a customer. This can literally be done in a matter of seconds! Enhanced file input support. Jpegs (.jpg compressed format that most digital cameras save in) and windows bitmaps (.bmp standard for photo quality images within windows operating systems) can be used for house photos and/or any of the effects i.e. brick work, flooring, profile etc. Enhanced file output support. Finished overlays can now be stored on your computer in either the Jpegs (.jpg) or windows bitmaps (.bmp) formats. Jpeg's are smaller files which means you can fit far more photo-overlays using the .jpg format than bitmaps to your computer. DFX export. The Conservatory model can now be exported to a DXF file, which in turn can be imported in to other CAD packages. Volume can be viewed as soon as overall dimensions have been entered. Built-in 'Conservatory Information dialogue' displays a breakdown for volume, floor area, base area, wall area, brick count (from floor up) and pitch etc. Conservatory facet sizes can be adjusted to suit. Inner skin (Cavity, thickness and material). Copy to Order function. 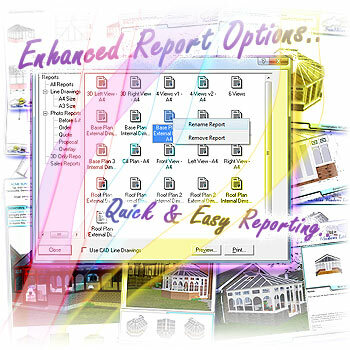 This allows you to copy a conservatory quote to an order, whilst keeping the original quote intact. JOB TRANSFER function. This ingenious feature lets you export quotes and orders to files (the co6 file type). These files can then be imported in to the same version of the software installed on a different PC/laptop. These files can also be transferred via email! SKIP function. Allows you to skip screens to speed up conservatory configuration. Comes with preset report groups, including a 'Sales Pack' (all of which, you can change to suit). 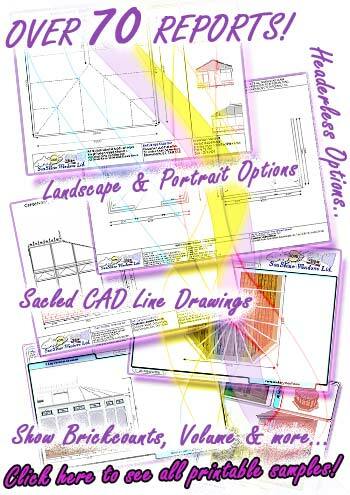 Many of the line drawing reports can also be scaled using, "user definable"" scaling, ideal for planning. Numerous reports also detail conservatory volume, floor area, base area (to external wall) and a brick count (from floor up, for inner and outer skin.). 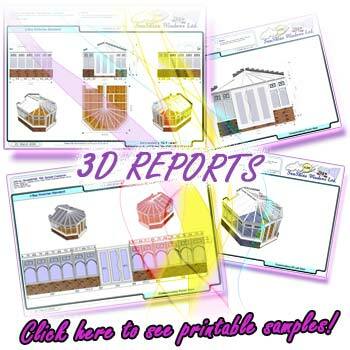 Your own company logo can be shown on reports. 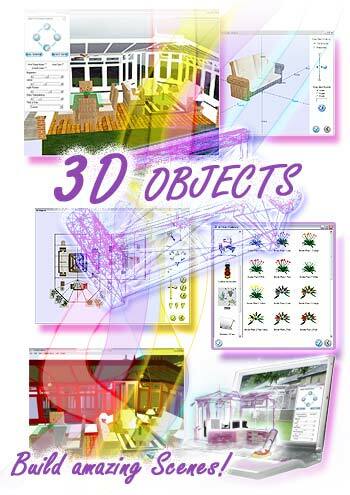 Huge 3D Object library containing sofas, chairs, tables, plants, radiators & more! Even a bird table can be added! FACT: As with all the ComfortableConservatories features, this option is at no extra cost. It is included in the price, offering even more value to the already feature-rich system! ComfortableConservatories boasts extensive 3D real-time photo-overlay features aimed at the perfect conservatory photo impressions. 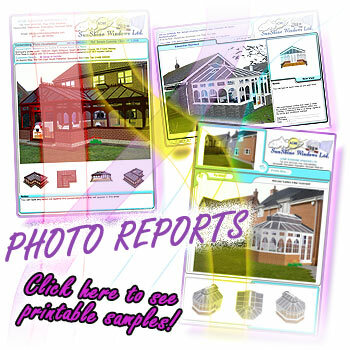 A solid roof can be displayed and an image mapped to it. 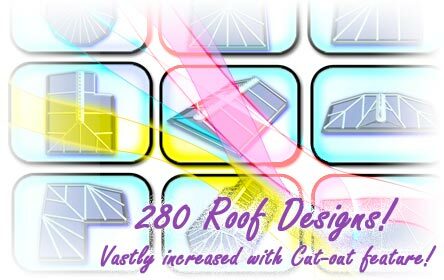 This unique feature allows you to show a tiled roof choosing from over 30 tile/slate designs, or by adding your own! Window and/or roof blinds can be displayed using the blind image of your choice. Plinth wall can be applied to the conservatory base and the height of the plinth can be altered. Profile colour can be changed to any colour or texture, including dual profile colours i.e. woodgrain-on-white. A name can also be given to the chosen colour for reporting. Internal wall texture can be changed using photo-quality images. Box gutters can be displayed on any conservatory, even above walls and panels! Full screen mode & more! Time of day lighting settings. Adjusts the lighting position to jump to different times of the day, for the light to fall on the conservatory accordingly. Arches can be added to any panel and adjusted to suit. This caters for "Arched Corners", "Arched Head" and "Arched Bar"
This vastly speeds up Conservatory configuration.